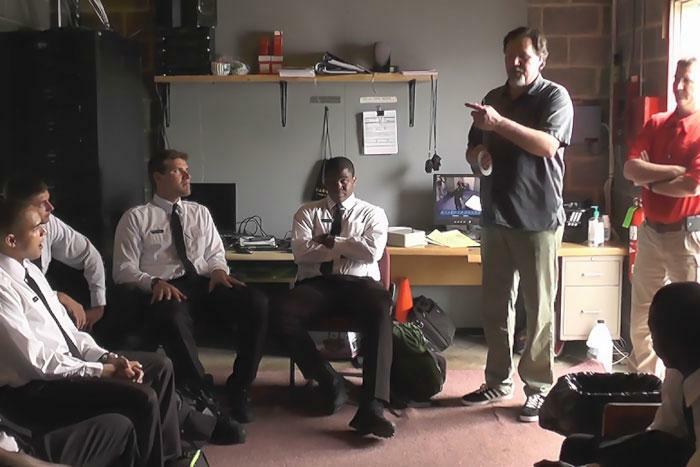 Assistant Professor of Psychology Jon Page (standing right, gray shirt) and Mike Guido, captain of law enforcement operations and patrol in Dickinson’s Department of Public Safety, (red shirt) brief cadets from the Baltimore City Police Department. Photo courtesy of Jon Page. It’s no secret that deadly incidents involving the police have been making headlines for the past year. Names such as Michael Brown in Ferguson, Mo., Eric Garner in Staten Island and Freddie Gray in Baltimore have taken turns being focal points in the conversation swirling around escalation in police-citizen encounters. And in the wake of the deaths of these men and others like them, episodes of unrest and nationwide protests have followed, and the chain of outrage has lit up social media like an atom bomb. Now, a professor at Dickinson has developed a training program for police officers that might make all of this moot one day, preventing these deaths and their cascading aftermath. C2 is a combination of three techniques designed to keep officers calmer than they ordinarily would be and to envision what they would do in certain dangerous scenarios before they ever have to do it. The first technique is “tactical breathing,” through which an officer controls and slows breathing to keep the heart rate down. Second is mental imagery: Officers imagine how a situation might evolve and what they might do to navigate it effectively. This creates a level of preparedness that bridges action and reaction with “automatic thinking,” the result of mental pathways being constructed through the exercises. Finally, what Page calls “tac-talk” comes into play. Tac-talk comprises tactical-based self-talk exercises aimed at modifying behaviors through mentally pairing a word with an action—e.g., “trigger” might be paired with the act of keeping the index finger off the trigger of the gun, to prevent accidental discharge. Done repetitively, this builds a neural pathway and lets the word subconsciously guide the behavior. The study was conducted with a group of cadets who underwent C2 training and then engaged in exercises immediately after being pepper-sprayed, a jarring event included in all cadet training. After the exercises, Page tested the cadets’ memories. He found that the 33 cadets who received C2 training remembered more information from the exercises (10.31 items placed in the test area) than the 30 cadets in the control group (7.80). Moreover, cadets who reported using tactical breathing remembered more information (9.97 items) than those who reported not using it (7.85). And post-event, the control group’s heart rate spiked significantly from both resting and pre-spray values, whereas the experimental group’s heart rate remained the same pre- and post-spray. In other words, C2 trainees retained more of what they witnessed in the scene around them, and the stress of the situation was minimized, just as Page’s research had predicted. Another remarkable aspect of C2 is that, as Page points out, improvements in memory occurred with minimal training—the group training sessions were only an hour and 15 minutes each and occurred a week apart. The pepper-spray results led to a paper titled “Brief Mental Skills Training Improves Memory and Performance in High Stress Police Cadet Training”—authored by Page, Guido, Zwemer and Michael Asken, the head psychologist at the Pennsylvania State Police—which was recently published in the Journal of Police and Criminal Psychology. They also led Page to State College, Pa., where he trained cadets enrolled in the Deputy Sheriff Academy in C2. As part of their standard training, cadets explore a possibly dangerous simulated residence (with simulated gunshots prompting them to enter) with no idea what to expect—a perfect high-stress situation to test C2. The outcome was again encouraging. Success with cadets from the state police and the deputy sheriff academies prompted Page to pitch C2 to the Baltimore Police Department. Baltimore quickly agreed to implement Page’s techniques, and the cadet class entering the academy in January 2015 became the first to undergo the training. Although the death of Baltimore’s Freddie Gray delayed the inaugural class by two weeks, Page and his team went to Baltimore six times: three to train cadets and three more to train the academy trainers. For the exercises, the experimental group of cadets underwent C2 training and then engaged the academy’s Laser Shot setup, a simulation in which scenarios are projected and cadets must interact with the images in real time. They also used a "sim house" similar to the one at the deputy sheriff training facility. Page now has the control group findings from Baltimore in hand and is waiting for the new class to graduate so he can gather the experimental-group data. In the meantime, he has already signed up the state of Washington as his next C2 academy, and those cadets will begin training in the fall. Additionally, both the Baltimore Police and the Deputy Sheriff Academy have indicated that all future incoming cadet classes will undergo C2 training, and discussions are underway regarding training veteran officers as well. The uncanny timing of the research coming together with headlines about use-of-force issues hasn’t escaped Page.